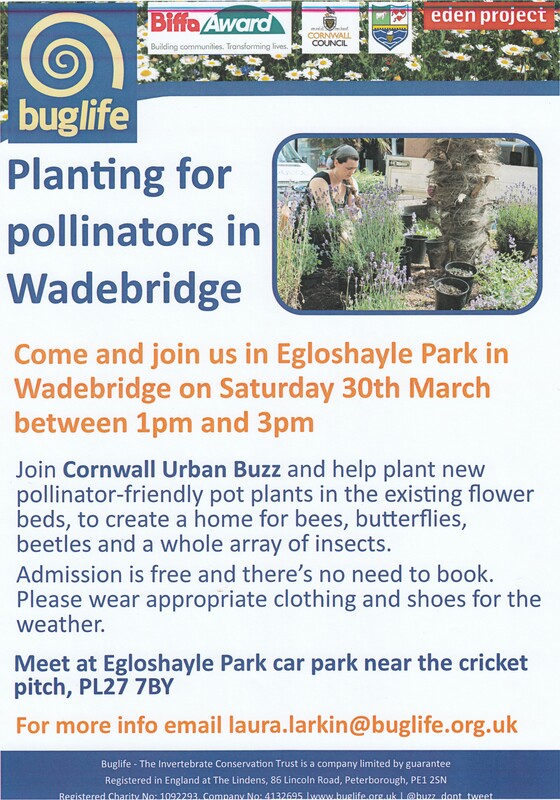 Come and join us in Egloshayle Park in Wadebridge, on Saturday 30th March between 1pm - 3pm. The Town Council would like to respond to a number of comments made in relation to the devolution of the Library Service from Cornwall Council. In 2015 Cornwall Council announced that it was considering the options for the delivery of the library service in the county, and asked town and parish councils to submit a business case as an expression of interest. Wadebridge Town Council expressed an interest as the Library is located in our town and provides a service for our community which is very much more than ‘just books’. With the help of our Community Network Link Officer we embarked on a process that was to last 3 years, culminating in the transfer of the service to Wadebridge Town Council on 3 December 2018. Wadebridge Town Council is located in a Community Network Area comprising 12 Parish Councils. At the outset of the devolution process parishes in the Network area held a series of meetings with the aim of establishing a multi parish group to fund the delivery of the Wadebridge Library service. This approach was taken as a wide geographic spread of users of Wadebridge Library was identified which extended beyond Wadebridge Town Council boundaries. At this stage Wadebridge Town Council decided it would run a public consultation to ask its parishioners about what they thought about the Town Council taking over the delivery of the library service. The consultation ran for 6 weeks in May and June 2016. The consultation was available to complete online, in person at the Town Hall and in the Library and in Wadebridge Street at the Royal Cornwall Show. Respondents came from Wadebridge, Egloshayle, St Breock, St Endellion, St Ervan, St Issey, St Kew, St Mabyn, St Minver Highlands, St Minver Lowlands, and St Tudy. Over a third of respondents stated that they used the library weekly, and over three quarters of respondents indicated that they used other town services on the days they visited the library. Nearly 99% of respondents wanted to see the library service continue in Wadebridge, and 82% said they would support paying 75p a week extra on their precept to keep the library open. Once the consultation analysis report was reviewed by members of Wadebridge Town Council, it was decided that there was a mandate from the public to move forward with the devolution process, and for Wadebridge Town Council to take on the service provision. On taking the decision to proceed with the devolution of the library service a working group was set up with regular meetings held in the Town Hall with Cornwall Council. This was a lengthy process which involved the transfer of the freehold of the building, the TUPE transfer of staff and agreement on the service delivery contract between both Councils. During this time the Town Council continued to discuss the devolution of the Library Service at its Full Council meetings which are held monthly and are open to the Public. The devolution process continued for 2 years before the service was transferred to Wadebridge Town Council. During these 2 years any interested party were able to attend Full Council meetings and take the opportunity to comment. The Town Council considered that applying a 75p a week increase immediately to fund the library was too great an increase in one year for its residents and took the decision that this should be applied over 3 years. In 2017/18 Precept increased by 7.5% which equated to a 14p per week increase for a Band D Property. 2018/19 Precept increased by 10% which equated to a 23p per week increase for a Band D property. For 2019/20 the precept increased by 35p per week for a Band D property (10%). Over 3 years the increase in Precept amounts to a 72p per week increase for a Band D property. Over these 3 years the Council has utilised reserves to ensure that the Precept has not needed to increase further and has also absorbed the increase in costs of the provision of other services that the Town Council delivers. Increases in Precept are made to ensure the continued delivery of all Council services. The increase of 72p per week over 3 years has supported not only the devolution of the Library but all other services the Town Council provides. The Town Council are very aware that the cost of the delivery of the library service, and maintaining the building is now falling on the shoulders of Wadebridge Town Council tax payers via the precept. In the Budget and Precept document that Wadebridge Town Council submitted to Cornwall Council for the year 2019/20 the library will cost approx. £88,000. Our precept to meet our budget for 2019/20 is £478,905 so the library alone is taking up over 20% of this. The Town Council also operate The Platt and Egloshayle Public Toilets – both devolved from Cornwall Council. This has contributed to the increased budget and Precept position for 2019/20. These toilets cost the Town Council £41K per year – an increase of £10K since 2016/17. We are also planning to improve the facilities at the Platt in the coming year. In 2018/19 the Town Council agreed to fund public CCTV in Wadebridge and there are now 6 CCTV cameras operating throughout the town which are being monitored by Cornwall Fire and Rescue HQ at Tolvaddon. The Town Council will continue to provide this service and will fund ongoing maintenance and monitoring costs in 2019/20 to support our town and businesses at a cost of £10K per year. It must also be noted that the Town Council pay Business Rates to Cornwall Council which amounts to approx. £68K a year – 14% of our Precept is for Business Rates payable on our Toilets, Car Parks and Library. 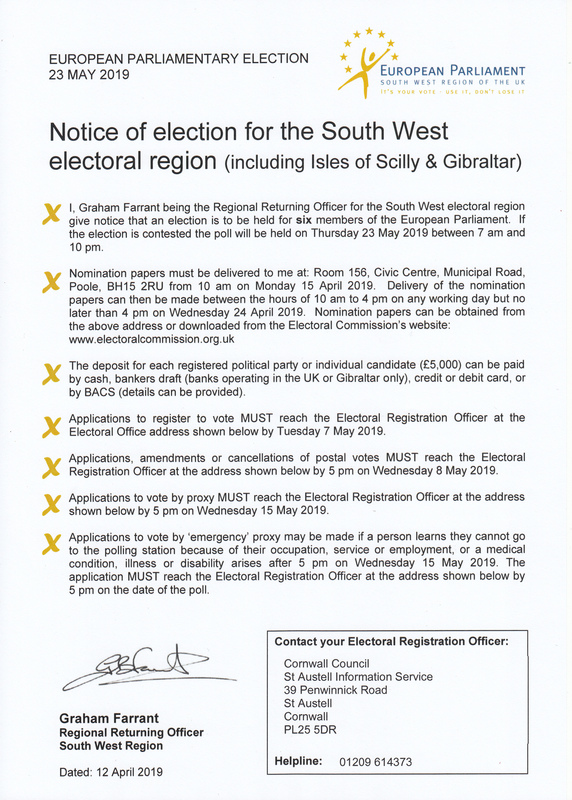 The Town Council look ahead positively to the Community Governance Review to be carried out by Cornwall Council which is now due following the completion of the Local Government Boundary Commission for England (LGBCE)’s review of Cornwall Council’s electoral arrangements. Wadebridge Town Council currently provide services to a much wider area than our boundaries define and to a significantly greater number of people than on our Electoral Roll. With additional homes projected and an associated increase in population there is a need to ensure that Wadebridge can respond to future challenges. A structure needs to be in place to ensure the effective, efficient and fair delivery of services for our community. For your information a Band D property in Egloshayle Parish in 2018/19 was £42.04 and in St Breock Parish was £53.59. In 2018/19 Wadebridge Town Council’s Band D was £183.02. Parishioners from all Councils use the services provided by Wadebridge Town Council with only Wadebridge Parishioners contributing to the costs of delivering these services. The Town Council hope the Community Governance Review will provide a fairer contribution from all users to Wadebridge Town Council services than currently exists. The Town Council received an offer to assist in the ongoing provision of the library service from St Endellion Parish Council only. It has recently been commented that Wadebridge Town Council did not get back to other Parishes about offers they had made to fund the service. If any offer had been received the Town Council would have been proactive in engaging in discussion with those Parishes. The reason the Town Council did not get back to Parishes is due to having nothing to go back to them on. To suggest otherwise is untrue and misleading. The Town Council did not choose to ‘go it alone’ with the Library. Our neighbouring Councils decided that they were unable to participate and contribute in the delivery in the Library service. The Town Council was therefore left to consider the real prospect of the Library and Information service ending in Wadebridge and the facility no longer available to the Community. The decision to ‘go it alone’ was due to that being the only option available to the Town Council following the investigation of alternatives. The Town Council do not prefer sole responsibility for the Library – we consulted our Parishioners who told us they wanted the town of Wadebridge to hold on to its Library. The Town Council and the Parishioners of Wadebridge have ensured that the Library service is preserved in Wadebridge for everyone’s benefit. For Wadebridge Town Council the ability to engage with all children in our community, to provide a place for people to meet and feel welcomed, to use computers for free, apply for a job, carry out online banking or meet with a banking advisor who comes into the Library each week, talk to someone who may have no one else to turn to, participate in a variety of activities for all ages or simply to read a newspaper at leisure is a service we believe is worth holding on to regardless of age, income, disability or background. Since 3 December 2018 the Town Council has recruited a new member of staff in the Library and now opens an extra day a week. We have acquired a fantastic team who work in the library and who are passionate about their service. We have a building which we are slowly but surely giving the due care and attention which has been long overdue. We are looking to develop services and increase the library in size including the provision of a public convenience. Please visit your Library in Wadebridge and see what it can offer you because the services it provides are much more than ‘just books’.